We’ve got high hopes for the graphical performance AMD’s Ryzen APUs can deliver in this stylish and thin 2-in-1 laptop. The HP Envy x360 15 has gotten the usual yearly laptop refresh with a thinner, lighter chassis and new 8th-generation Intel processors, but the most interesting wrinkle is the introduction of AMD Ryzen chips. Equipped with the similar ‘discrete-class’ Radeon RX Vega graphics found in AMD’s desktop APUs and Intel Kaby Lake G chips, this could be the first PC gaming-worthy convertible when it releases later this month. Pricing for the HP Envy x360 15 starts at $749 (about £550, AU$990) for an AMD-powered configuration that includes the Ryzen 5 2500U processor, Radeon Vega 8 Graphics, 15-inch Full HD (1920 x 1080) screen, 8GB of DDR4 RAM and an 128GB SSD. There’s also a higher-end SKU with an AMD Ryzen 7 2700U CPU and Radeon RX Vega 10 graphics that also doubles the storage capacity; HP has yet to release pricing for this model. Of course, there’s also an Intel-powered variant that starts at a higher $869 (about £640, AU$1,150) price. Aside from an Intel Core i5-8250U processor, this configuration also features a larger 256GB SSD drive. Although pricing has yet to be announced, users can bump up their config to an Intel Core i7-8550U with 12GB of DDR4 RAM and a 256GB SSD. If the Envy x360 15 looks a lot like the Spectre x360 15 – or even its predecessor – your eyes do not deceive you. 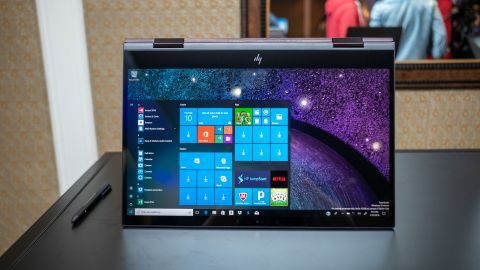 HP’s two convertibles look almost identical, although while the company’s flagship 2-in-1 laptop focuses on delivering maximum performance with Kaby Lake G and Nvidia discrete graphics, this hybrid is designed to be thin and light. To this end the Envy x360 15 is just 0.74 inches (1.88cm) thick and weighs 4.49 pounds (2.04kg), compared to the Spectre x360 15 at 0.76 inches (1.93cm) and 4.61 pounds (2.09kg) for the Nvidia version, or 4.72 pounds (2.14kg) for the AMD model. Comparatively, the last-generation HP Envy x360 15 was 0.77 inches (1.96cm) thick and weighed 4.55 pounds (2.06kg). Aside from these slight differences in dimensions, the HP Envy and Spectre convertibles are basically twins, down to the same angular lines and fingerprint reader on the right edge of the laptop, although the Envy x360 15 does sport a more interesting geometric pattern on its speaker grille. As with the Envy 13, HP has introduced a touch of Damascus steel – not the actual metal mind you, just a painted pattern – to the rear edge of the laptop. The only problem is that it’s even harder to see on this machine, as the laptop needs to be closed, and it’s only found on the bottom half and in the center of the notebook’s backside. In a classic Intel vs AMD matchup, the former will supposedly deliver longer battery life of up to 12 hours and 45 minutes, while the latter is only slated for up to 10 hours and 30 minutes. HP also boasts that all Envy x360 15 systems will feature HP Fast Charge, which supposedly can charge a device to 50% in 45 minutes. AMD-based systems won’t be at a complete loss, as these Ryzen chips will come with Radeon RX Vega graphics similar to Kaby Lake G powered laptops. Vega ‘discrete-class’ graphics have delivered respectable 1080p gaming performance in both the Dell XPS 15 2-in-1 and desktop Ryzen APUs, so we hope they’ll deliver the goods here as well. Aside from the performance and battery life these machines will deliver, there are plenty of other configurable options such as an optional 4K display upgrades. If you’re working on a tight budget, a tiny bit of Intel Optane Memory can help speed up systems equipped with only a hard drive. HP has also integrated its Sure View integrated privacy screen technology from its enterprise laptops into the Envy x360 15. This does an excellent job of masking the screen with a practically solid gray overlay if you view the screen from any angle other than directly in front. However, we noticed a fair bit of Sure View silvering the screen when we were using the laptop as normal. The good news is that you can toggle the feature with a keyboard shortcut, so we can see ourselves using it very sparingly, and only when we have sensitive information on screen. If you’ve been on the fence about a thick and heavy 15-inch convertible systems such as the HP Spectre x360 15, the Envy x360 15 may be just the machine you’ve been looking for. Whether you’re after the Intel model’s promised long battery life, or the gaming potential of the AMD-powered configuration, this 2-in-1 laptop should have something for you. Of course, that’s all conjecture based on HP’s claims, and on our experiences with integrated Radeon RX Vega graphics in the past. Check back soon, as we’ll be putting this laptop through its paces to see if it can make good on its promises.